Have you ever made or seen a penny ball? I saw these images when I was rambling around Pinterest and thought how clever! I have always loved spheres in gardens, but most of the ones I have been drawn to are quite expensive. This one piqued my interest, because it could be made with pennies. All you need are a bunch of pennies and an old bowling ball to make a beautiful garden sphere, that not only repels slugs, but also makes hydrangeas blue? I think this could be a fun summer project! 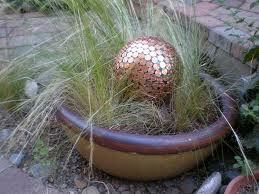 The pennies don't patina like 100% copper does, but what a great looking sphere to add a little interest to your garden. You have to use a really strong glue like Amazing Goop in Home and Garden or marine formula because it is UV resistant and waterproof according to Beth Evans Ramos of a Greener Life. I am going to start saving my pennies now so I can make a penny ball this summer! Of course I have to find an old bowling ball too but that shouldn't be so hard, right? Finally, a purpose for a penny other than weighing down my purse! Poinsettias should be placed in a room where they will receive good natural light, enough to comfortably read a newspaper. They should also be kept away from hot and cold drafts. Night Temperatures of 60°F and daytime temperatures of 72°F will keep the bracts colorful. Poinsettias should be kept evenly moist while blooming. Check them daily. When the surface is dry to the touch, water thoroughly until water runs rough the bottom of the pot. Poinsettias should never sit in water. If you have a saucer under your Poinsettia pot, be sure to empty the excess water. If your Poinsettia has survived the holiday season, trim it back. Leave 6 to 10 inches of growth on the plant. Continue to grow your plant as a houseplant. Regular feedings with a high phosphorus fertilizer like Miracle Grow will help produce vigorous growth. October is the time to start the process that will prepare your Poinsettia for the Christmas season. Starting October 1, keep your Poinsettia between 65°F and 75°F. You need to provide the Poinsettia with a false day length. Begin by placing the plant in COMPLETE DARKNESS. A light proof box that can be placed over the plant at night and removed in the morning will do fine. A dark room or closet can work, too. During the short 8 to 10 hours of daylight, supply your Poinsettia with bright light. The "night" is most important. If the plant darkness is interrupted, you must begin the process over again. The reduction of "daylight" will affect the plants water intake. Picking up the plant and using the weight as a guide, you will be able to assess the moisture content of the soil better than a moisture meter. This treatment needs to continue until the buds, which will be the bloom center, form. During winter fill balloons with water and add food coloring, once frozen cut the balloons off and they look like giant marbles or Christmas decorations. It will add some color in the dormant or snow-covered garden landscape. What a great idea!!! that. There are many books available on the subject and if you go on-line you will find a ton of free recipes and patterns. The local stores probably have baking pans made just for that purpose. Plan on taking a lot of time – probably a whole week to finish the project, but it can be done in one day if you prepare ahead. Children love this project and the little house will last all through the holidays. My one warning is to start out with a small project. A cabin-type house can be beautiful and will bring a lot of joy to a small person. One year I did a Victorian style with a couple of wings on the house and very elaborate decorations. It was beautiful, but took several days, more patience than I actually had and took up the full table until I dropped it off for the grandkids (then my daughter had to deal with it). The smaller size we did the next year was definitely a better choice. If you use good frosting on it they are actually edible when you are finished. Many recipes recommend a frosting that uses vinegar that gets rock-hard and is not very tasty. Of course after they sit around for a few weeks who really wants to eat them anyway? Maybe you’d just like to make some gingerbread men. Kids love those too as do most adults. If you really don’t have a lot of time just make a good ginger cookie, sit down with a nice cup of tea and enjoy the smells of the season. The aroma of fresh baked gingerbread, the smell of an evergreen wreath as you open the door, the taste of cinnamon cookies fresh from the oven. Those are the sensual keys that the Holidays are upon us! Last month we talked about moving your rosemary plant into the house. You’ll be glad you did. Rosemary is the quintessential holiday herb. As a small Christmas tree it can be done in topiary to the classical shape and will fill your house quickly with its comforting fragrance. New Year’s gift. A sprig tucked into a card or under the ribbon of a package says, “Remember Me?” to those clever enough to understand the message. There are many varieties of rosemary on the market now and they all have something to offer. Some are delicate and creeping with deep blue blooms, some are very pungent and prickly; there are varieties with pink flowers and resinous leaves and one with broad leaves and light blue flowers. None that I have found are hardy to our zone, but with a little care they are all fun to use as indoor plants. ribbon for all the windowsills in her colonial style home. The whole house smells wonderful at holiday time. When watering your indoor rosemary try giving it a few ice cubes every few days. This will keep it from being over-watered and allow the water to really soak into the soil. This year make rosemary one of the keys to your holiday joy. Merry Christmas to All!